FENDI has announced the opening of its first ever airport boutique at London Heathrow, Terminal 4. 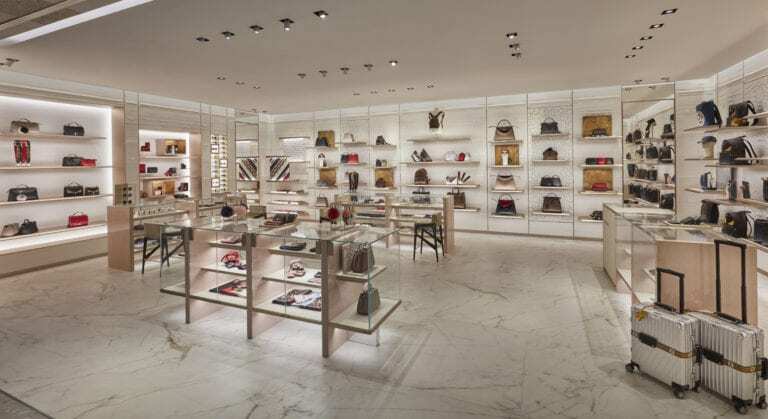 FENDI has inaugurated a permanent store in Terminal 4 at London’s Heathrow airport, making its debut in the world of travel retail. Located in the departure area, the boutique houses the brand’s collection of accessories including leather goods for men and women, plus an array of travel bags and suitcases. Recognised for the historically-acclaimed craftsmanship of its skilled artisans and extraordinary creativity, FENDI says its core values and artistic passion and character are on show in the new space, presenting an exciting new story for the Roman Maison. In addition, to celebrate the opening, the brand will install a FENDI pop-up store that will re-create a European “kiosk” full of a wide variety of items from the Fendirama gift and small travel accessories collections. The temporary pop-up will remain open for three months and looks to engage the airport’s travellers over the Christmas period – and will also attract Chinese passengers with a special presentation for Chinese New Year. Fendi CEO Serge Brunschwig hopes the Heathrow store will kick off a series of openings at key airports next year.